Landsat 8 Thermal Infrared Sensor (TIRS) image of the Larsen C ice shelf acquired on July 21, 2017. Jul 27, 2017 • The massive rift that ultimately separated iceberg A68 from the Larsen C ice shelf was influenced by the numerous suture zones that it crossed along its path. Suture zones are boundaries formed when neighboring glaciers on land join together when they flow into an ice shelf. Suture zones are composed of ice with different properties than the rest of the ice shelf. They are often underlain by a layer of marine ice, which is warmer and softer ice formed when ocean water freezes on to the bottom of the ice shelf. For reasons that scientists are still trying to understand, most suture zones are very effective at stopping cracks from growing. The large rift that eventually formed iceberg A68 initially broke through a suture zone in the southern part of the ice shelf that had previously stabilized neighboring rifts for at least 80 years. 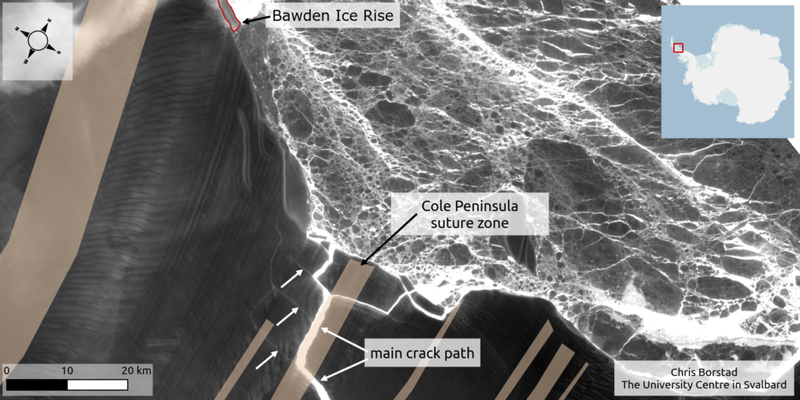 As the crack grew across the ice shelf, it temporarily paused every time it encountered a new suture zone. In this image, acquired on July 21, 2017, by the Thermal Infrared Sensor (TIRS) on the Landsat 8 satellite, the main crack is seen to turn sharply toward the front of the ice shelf when it encountered the Cole Peninsula suture zone. However, several smaller rifts propagated across this boundary. These cracks will form the boundaries of new, smaller icebergs that may break free from the ice shelf in the near future. Had the main crack continued its northward progression across the Cole Peninsula suture zone, it may have reached the Bawden Ice Rise. This small feature is a topographic high point on the sea floor that the ice shelf runs aground against. Although small in size, this pinning point is very important to the stability of the Larsen C ice shelf. It is likely that the ice shelf would rapidly destabilize if it were to lose contact with this point. Suture zones are clearly important for influencing cracks on ice shelves, and they may be one of the key factors that stabilizes large ice shelves like Larsen C. Scientists will continue to monitor Larsen C and other ice shelves to determine whether climate change may be weakening suture zones and thus destabilizing ice shelves. Editors note: Earth observing satellites have allowed researchers to watch the creation of iceberg A68 as it broke apart from the Larsen C ice shelf in near-real time. Satellite observing capability helps us all better understand our changing planet. The ability to watch the recent Larsen C ice shelf evolution, has been called a “triumph of satellites” by The Antarctic Report.